They have two names for themselves: erz?a and moksa. The Mordvins have not consolidated as a nation. Both tribes have their ethnic identity, even though statistics never make a distinction between the two. Both Erzya and Moksha are used as literary languages. The Republic of Mordovia is located at the Volga-Oka river basin (26 200 sq. km., capital city Saransk) where only 27.2% of the Mordvins live. Most of the Mordvins are dwelled in groups in the provinces of Samara, Penza, Orenburg, Ulyanovsk and Nizhni-Novgorod, partly also in Central Asia and Siberia. The number of Mordvins and their knowledge of their mother tongue began to decrease in 1939. Their percentage of the total population in their ethnic Republic is also decreasing (38.5% in 1959, 34.2% in 1979 and 32.5% in 1989). 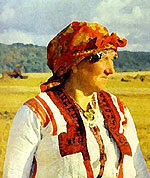 The Mordvins are the most dispersed of the Finno-Ugric peoples: in 1989 72.8% of them lived outside their Republic. They are a minority even in their own Republic (32.5% in 1989), especially small is their proportion in the cities (16.8% in 1970). The Mordvin national culture can be found only in the rural areas, the cities are dominated by newcomers and their life-style. Extensive economic industrialisation (the industrial production of 1970 was 13 times greater than that of 1940) has served the interests of the governmental economic and national policy. The effect of using Mordovia as the main zone of prison camps of Russia has also been negative. The demographic structure of the Mordvin people is out of balance, which is shown by the decreasing numbers of births and of young people. In 1926 51.9% of the population were 19-years of age or younger, in 1959 the percentage was 37.8 and by 1970 it was only 36.7 %. The language command also decreases with the decline of ethnicity. In the beginning of the 1970s, 77,000 pupils took classes of the Mordvin language or studied in Mordvin in 391 different schools, by 1995 only 5925 students had the Mordvin (2560 Erzya, 3365 Moksha) language in their school curricula. A major language shift has begun among the Mordvin people. This can also be observed in the attitude of the parents. In 1989 45.5% of the rural and 83.9% of the urban Mordvins preferred to educate their children in Russian schools, and 13.9% and 5% respectively in Mordvin schools. As culture is associated with language, it is worth mentioning that in 1970 35 newspapers were published in Russian, 1 in Erzya and 1 in Moksha. Between 1946 and 1955 81.4 publications per year were printed in Mordvin, but during 1976-1985 only half as many, or 46.6 publications per year. In 1992 there was one Russian publication per person, but only one Mordvin publication per 1,000 persons. The libraries had 7 books for each Russian reader, but 0.001 books for each Mordvin reader. The extent of the use of the Mordvin language for communication can be illustrated by the following example: in 1974 91.6% of rural Mordvins used their native language at home, 61.8% at work and 31.9% in public communication. The respective numbers for urban Mordvins were 21.7%, 1.8% and 1.1%. 1950s - continued industrialisation and colonisation encourage assimilation and the destruction of ethnic culture (especially in cities).